I have an unusual relationship with football. Before attending Ole Miss my experience and knowledge of football was slim. I did not grow up watching football on Sunday afternoons and my parents both went to schools without football programs. So, I immediately latched on to the one are of football that connected with me: tailgating. I spent my fall weekends during undergrad at the most magical place on earth, The Grove. I wore dresses, ate and drank far too much, and halfheartedly watched Ole Miss football. Not being able to spend my weekends in The Grove has changed the way I approach football. I now settle down on the couch with my husband to enjoy a few cold beers and snacks. 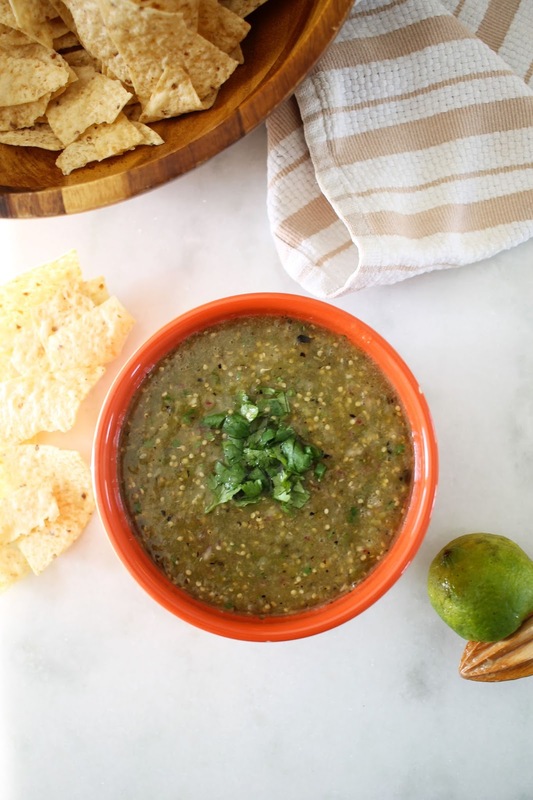 Our game day meals change, but they usually involve something that is perfect for grazing like this roasted tomatillo salsa. 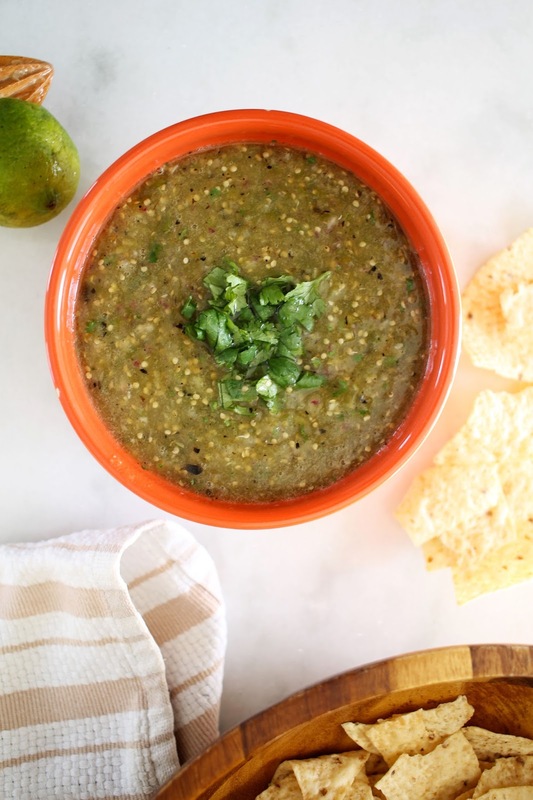 This salsa recipe could not be easier. 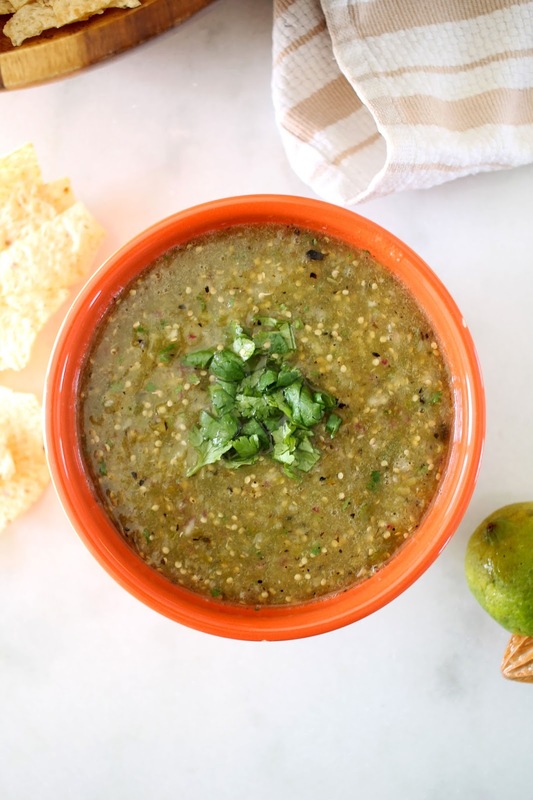 Toss a few tomatillos in the oven to get them charred and blend until smooth. I serve it alongside some tacos or guacamole for an tasty gameday treat. Preheat oven to 400 degrees. 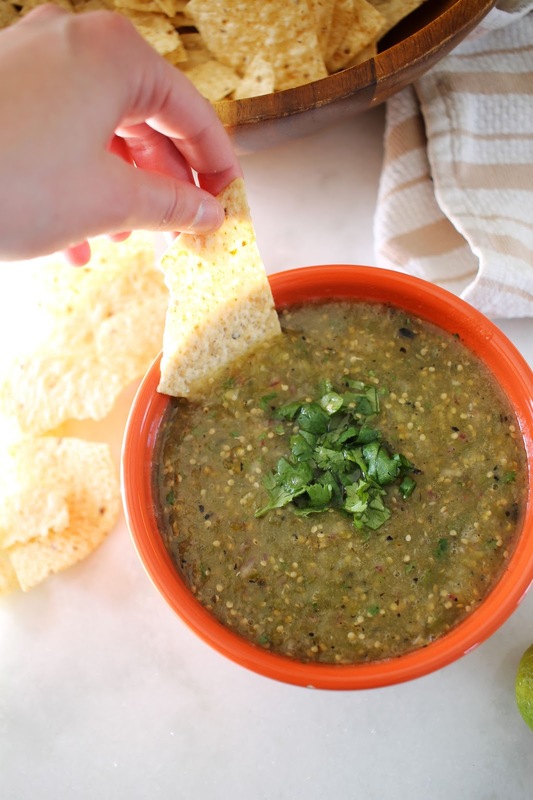 Remove husks from tomatillos, rinse with water to remove any stickiness, and place on a small rimmed baking sheet. Place jalapeno on baking sheet along with tomatillos. Place in oven and roast for 1o minutes, flipping halfway through, until tomatillos and jalapeno are charred. Place red onion and garlic in a food processor. Pulse mixture in the food processor a few times until broken down. Then, add tomatillos, jalapeno, cilantro, and lime. Pulse until salsa reaches your desired consistency (I like mine pretty smooth). Season to taste with salt and pepper. Serve immediately or refrigerate.